I discovered my 'thing' pretty late. Not that, don't be stupid - I'm referring to the virulent notion that there's SOMETHING you're supposed to do with your life. Normally caught some time before 'career goals' replace 'I want to be an astronaut' but after you stop believing in Santa, children experience this illness chiefly in temporary fads and phases, but, like polio, sometimes it fucks you up for life. Black Metal was my thing, and I caught it late, at 15. Judas Iscariot were in the first crop of 5-10 black metal bands I ever heard, and 15 years on I'm still feeling the effects of this exposure. The man behind Judas Iscariot, Andrew Harris, seems to have caught it early, putting out the project's first demo in 1992, particularly when one considers that most of the black metal albums we consider genre defining hadn't been made yet. 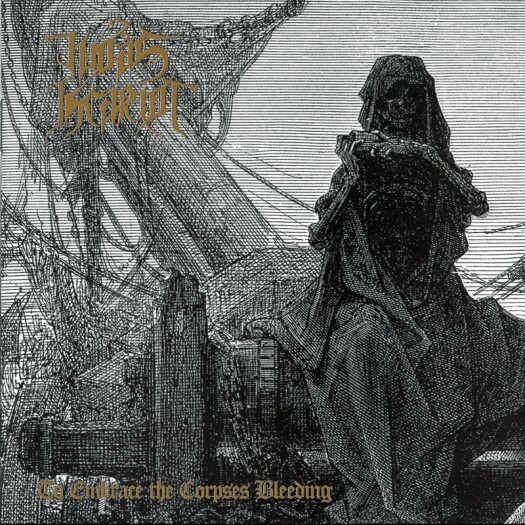 In this sense, Harris was perfectly positioned at the nexus of the burgeoning black metal culture, and this is reflected in Judas Iscariot's music. Black Metal, or at least its original iterations, can generally be identified by region sonically – the descending chord progressions and melancholic chill of Scandinavian black metal; the awkward timing and ascending nodes of French and Benelux black metal; the bass heavy and percussive South American scene, and so on. Harris combined these elements in various forms at different points in Judas Iscariot's discography, but on To Embrace the Corpses Bleeding, the final Judas Iscariot full length, he finally presents his unified vision and immediately withdraws from the scene in the liner notes of the CD. How bold, how dramatic, how enfant terrible! That this is a self-reflexive move is beyond doubt – this is 'gaze on my works ye mighty and despair' territory. Where previous albums seemed to be challenges to other bands or movements - see Distant in Solitary Night's precise, metronomic deconstruction of post-Transilvanian Hunger Darkthrone and Heaven in Flames' two fingered salute to Emperor's speed and synthesizers – To Embrace... is both varied and unified. It also has the most consistent and effective sound production of Harris's entire career, the warmth and fat tone of the rhythm section presenting an elegant juxtaposition against the icebound guitar and vocals – the music was written in the USA and the lyrics in Romania and Germany, and you can feel the old world and the new straining against one another. This, along with the artwork lifted from Dore's Ancient Mariner engravings, makes perfect sense when one considers Harris's immediate relocation to Europe following the completion of the Moonlight Butchery EP the same year as this album. His last works before escaping into solitude speak of dislocation, isolation – a perfect soundtrack for the vast ocean Harris would cross both personally and musically. However this is no forlorn retreat. From the liner notes to the strident song titles which proclaim 'In the Valley of Death, I am their King', this is the king withdrawing to his mountain, not the creature crawling beneath it. The overt fatalism of Dethroned, Conquered and Forgotten two years before feels a million miles away. This might be the end, but it brings with it the winds of Ragnarok – maybe not a bang, but certainly not a whimper. Great review for a great album.